GENKAN™ leads the way with its automated statutory trust accounting software functionality integrated into the solution. Designed around a matrix of fully customisable accounts, funds are automatically distributed after booking completion into appropriate “bucket,” where the money is ready for disbursement according to your business properties. The automation of GENKAN makes trust account reconciliation a simple “5 minute” monthly process and GENKAN provides output of the bank reconciliation data for a fast upload with an ABA file to online banking. In that time it sends accounts and invoices to owners. The Trust accounting of GENKAN caters primarily for holiday rentals property management but includes functionality for permanent rentals and also property sales deposits. trust accounting software. The user interface of the accounting system is simple and intuitive, and the requirements are straight forward and well defined. The functionality includes the Trust account journal and trail balance reports satisfying the most diligent of Trust Account Audit. Funds disburse easily to owners, management and vendors using our unique check queue system. 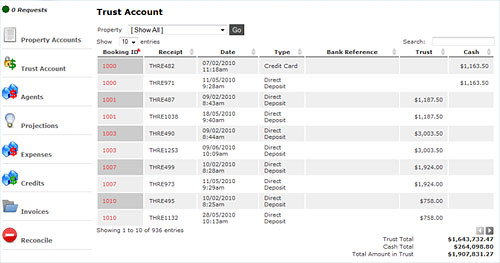 At any time the administrator can check trust account balances, amounts ready for reconciliation and much more. Owners can through their owner login check, view and download current and past monthly statements, see future projections of income and expenses. GENKAN automatically sends a compliant and fully customisable trust reciept on receipt of any clients funds.